The Brookie Fin is another of the six (known to me) historic brook trout fin wet fly patterns. This pattern was published in Helen Shaw’s second book, Flies for Fish and Fishermen: The Wet Flies, 1989, Stackpole Books. I uncovered mention of using the brook trout fin for bait in Favorite Flies and Their Histories, 1892, by Mary Orvis Marbury. I remember my dad telling my brother, Larry, and me about that when we fished small mountain streams in northern Lycoming County, Pennsylvania, back about 1961 or ’62. We scoffed. He promptly gave a demonstration; taking a fin cut from a brook trout, impaling it on a hook, swinging it into a small pool, and catching a brookie on the first cast. Brookie Fin – classic wet fly pattern from Helen Shaw’s book. Tied and photographed by Don Bastian. 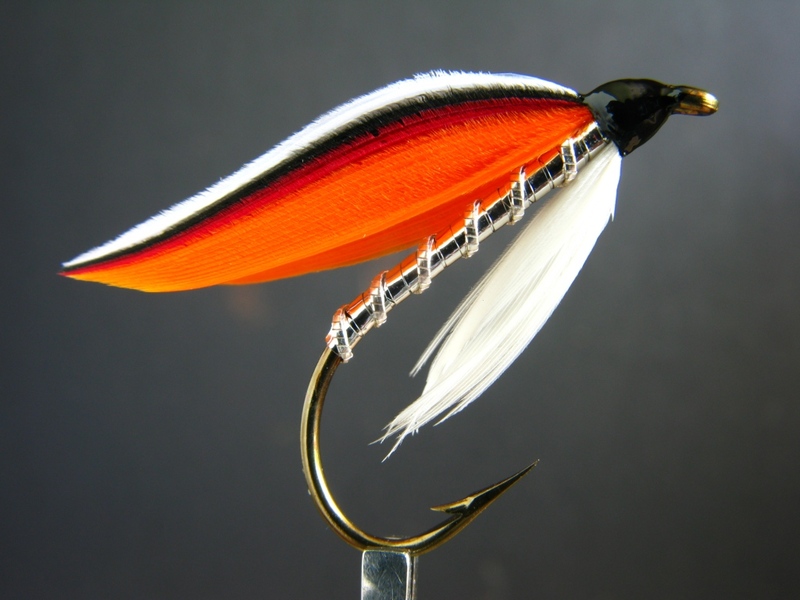 Shaw’s formula in the recipe plate for the Brookie Fin calls for making the wing 2/3 orange, and 1/9 each Red, Black, and White. That is accurate, but personally I don’t feel like doing more math than I absolutely have to, especially math with fractions, and when I’m tying flies to boot. I generally use two strips each of white, black, and red, and make the rest of the wing, about 2/3, orange. That’s good for #4, #6, and #8 hooks. On a #2 hook, I’d go with three barbs or flues, and on #10 and #12 hooks, one must use only a single barb each of the topping colors. This type of detailed married-wing wet fly tying is what separates the men from the boys, or the women from the girls. It requires good keen eyesight, and steady hands. The book is out-of-print, but may be found if one looks. The ISBN No. is: 0-8117-0607-9. Though originally published in 1989, Flies for Fish and Fishermen: The Wet Flies remains as the best wet fly tying instructional book presently available. – Don Bastian. This entry was posted in Fly Pattern Recipes, Wet Fly Photos and tagged Brookie Fin, Don Bastian, Favorite Flies and Their Histories, Flies for Fish and Fishermen: The Wet Flies, Helen Shaw, Mary Orvis Marbury. Beautifully done photo, Don. Folks don’t generally know how hard it is to keep specular highlights (glare from the lighting) off the lacquered black head. You’ve done a really nice job. And of course what a piece of art the fly is itself. The wraps are exquisite. I photograph beside a window, head of the fly facing the window; and use a large piece of white foam-core to bounce or reflect light back onto the shadowed or darker side of the fly. I also filter some of the light from the window side as needed. Hope you are doing well! Thanks for your comment and compliments on the tying! My favorite! Beautiful fly, beautiful tie. You are the Master! Thanks Bob! I appreciate that very much! Hi Don…I never knew the Brookie Fin had a red strip!…I always thought it was just the three colors on the wing. Thanks for bringing that to my attention. Yup! The Brookie Fin does have the red strip. My original Olive Trout Fin, that I posted on the Classic Fly Tying Forum several years ago, also has the red strip in the wing. I got the idea for that from Helen’s Brookie Fin pattern. Thanks for your comment! Gorgeous fly Don! I love the brook trout fin flies! I really want to fish one but they are so beautiful and time consuming to tie, I can never bring myself to tie one on! Great stuff Alec! I met with a woman whose father knew Art Kade and also met Helen when she was working for him. I’d say with the information you have, if Helen named that pattern as “Kade’s Brookie Fin,” then that probably seals it. She does not give credit for its origin in her book, Flies for Fish and Fishermen. My friend mentioned that she was pretty sure that Art Kade taught Helen to tie. Thanks for your due diligence and for your comments!